Hello, and welcome to JT Hughes Honda Shrewsbury. 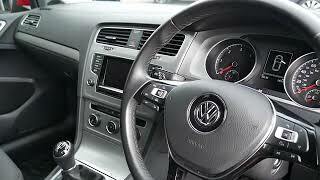 Today I'm going to be showing you around this VW Golf. So this car is a 1.6 diesel and it's a manual. As you can see, it's got the alloy wheels. It's in a solid colour, this one, so solid red. 14-plate with very good mileage. Good condition as well. Car's got two keys and service history. So the car will come with a 3-month warranty, but you can extend that to12 months. We've also got a good selection of used car finance. You can have that on HP or PCP. Like I say, good condition this car. Very good on fuel as it's the diesel and very cheap on the tax. OK, so inside you got electric windows all around. Height adjustment there on the driver seat. All these seats are in cloth. So the car does come with rubber mats, the front and back. And it's got the rubber boot's tray as well. You do have auto lights and auto wipers on this car. You've got Bluetooth. cruise control. Right in the centre there, you got your radio, all your media. Like I said, the Bluetooth's on there as well. Add a bit further down, you've got your air conditioning, all your heating, 5-speed manual gearbox. Obviously, your stop/Start function's there as well, electric handbrake with the auto hold. Good spec car. And in the back, plenty of space in here. Centre armrest there with cup holders. And there is a very good boot size here on the Golf. Like I said, you do have that rubber boot tray. And there's a spare wheel underneath there, as well. So if you want some more information on this car or would like to come along for a test drive, also talk about the finance figures, why don't you come along to here to Shrewsbury which is on Battlefield Road in Shrewsbury? Thank you very much. Don't ignore a car recall!